A Smithville man faces multiple charges following his Aug. 19 arrest by the Cannon County Sheriff’s Department. Deputy Eric Moss was patrolling Short Mountain Road at 11:50 p.m. on that date when he met a vehicle in the oncoming lane traveling 18 miles per hour. As Deputy Moss approached the vehicle in his patrol unit, it crossed the double yellow line, nearly striking his car. The deputy turned around, initiated his emergency equipment, and was able to get the driver to stop the vehicle near Cap Young Road. The driver of the vehicle was identified as Joshua R. Cripps, 541 Hodge Rd., Smithville. 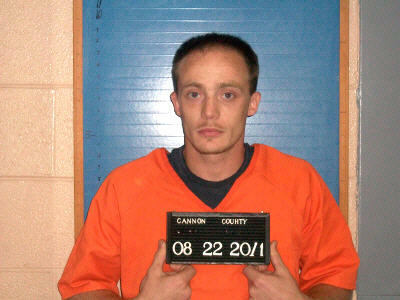 He was transported to the Cannon County Jail and booked on charges of driving on a suspended license. He was also issued a citation for violation of the wheel tax law. Further investigation led to Cripps being charged on Aug. 22 with possession of Schedule II, III and IV drugs with intent to deliver or sell, including Loratab, Xanax and Oxycodone. He was also charged with simple possession of a Schedule VI drug and possession of drug paraphernalia after a Crown Royal bag containing a Camel Snus can with contained marijuana was discovered. Cripps admitted the bag belonged to him. A charge of criminal impersonation was lodged after its was learned Cripps gave Deputy Moss the wrong date of birth and social security number was he was originally arrested. Having waived a preliminary hearing and having his case bound over the grand jury, Cripps is scheduled to appear in Cannon County Circuit Court Thursday (Sept. 1) after stating in General Sessions Court Thursday his intention to plead guilty to some of the charges.